A User - friendly solution for wide larder unit's offerings optimum accessibility from three sides. The rounded shape of the elements ensures that the every last inch of storage is put to good use. The unobstructive non slip mat sticks to the shelf surface and can be removed for cleaning..
All of the shelves can be pulled right out of the unit and accessed from there. Maximum use (cover 80%) of the storage space available in a corner unit. The shelves and fittings form an integrated whole with frames and side-out systems. The front shelves can be positioned at any height, mak.. Automatically slides out of the unit when the door is opened. Easy to access from three sides and from above. Your main cooking utensils are within easy reach. Universal mechanism for left hand side or right hand side opening. 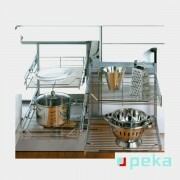 Less work and more efficiency, whether your kitchen is big or ..
Pecasa means smart living for greater comfort. Create your own customised space in just a few easy steps: a simple, clear and adaptable solution A few simple, but highly versatile components that can be combined in an infinite variety of ways Metal shelves come with built-in concealed shelf..
A practical larder that opens smoothly for furniture with hinged doors. The entire mechanism pulls out of the cupboard automatically when the door is opened. All components are linked in a smooth flowing opening movement, and the mechanism comes to a cushioned stop. Universal mechanism for .. Automatically slides of the unit when the door is opened. Easy to access from three sides and from above. Your main cooking utensils are within easy reach. Universal mechanism for left hand side or right hand side opening. 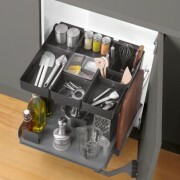 Less work and more efficiency, whether your kitchen is big or smal.. This corner mechanism makes best use of available space. 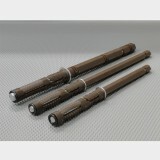 Has excellent sliding properties and features the SoftStopp Plus soft-closing system. Its clip-on front cuts assembly time in half. Tool free alignment of the shutter (3 dimension). The shelves can be positioned at any height, makin..
Simple-to-use slide-out storage space. With its integrated SOFT CLOSING mechanism for side and back-wall frames, this ingeniuos and high-performance space-saving solution is an invaluable asset to any modern kitchen. Storage space can be accessed from two sides. 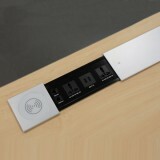 This unit includes back-faci..
Ergonomic lift system for high wall cabinets. Ability to adjust counter weight with the turning of the rotating adjuster. Four adjustable shelves are provided which can be removed & hooked on to different heights. The entire system can be easily pulled down or pushed back which has Soft..
Full system including sliding system (can be retrofitted). Integrated soft - opening, soft - closing system. Tall front bracket with 3-D adjustment for maximum stability. Handy additional container for compost or cleaning materials. Waste bags of various sizes can be clipped into the .. 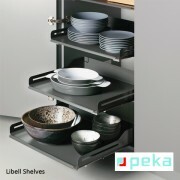 The practical, versatile Pesolo pull-out shelf can be used in wardrobes or as an extra pull-out for waste systems. The two trays are easy to remove and replace when cleaning. The system comes with 10 hooks, which can be clipped on individually underneath the trays. It can be installed on the .. Excellent access from both sides. Optimal use of space. The shelves closed bases stop bottles and spice jars from toppling and small items from falling through. Shelves can easily be removed for cleaning. Applicable for 2 litre plastic bottles (150 mm pull-out). Straight forwa.. Suitable for storing items in corners, under the sink and in bathrooms. The pull-out system can be used either as a front pull-out or as a pull-out unit fitted behind hinged doors and comes with full extension runner and with an integrated soft closing device. Unbreakable transparent inserts ..
Side-mounted clip-on system makes full use of available cupboard space, and organises it too. Plenty of space for an airer or an ironing board. Adjust the height of the hose/broom holder, clip-on shelves and hooks, depending on the items being stored. Height-adjustable clip-on elements.. Foot Pedal allows you to open the door hands-free. Easy to operate - simple and hygenic. .. This discreet pull-out shelf blends perfectly in kitchens, living rooms and dressing rooms. It combines direct access through the front of the shelf with an excellent overview of shelf contents, making it truly unique. 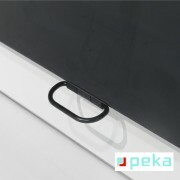 The unobtrusive magnetic non-slip mat stick to the shelf surface &..